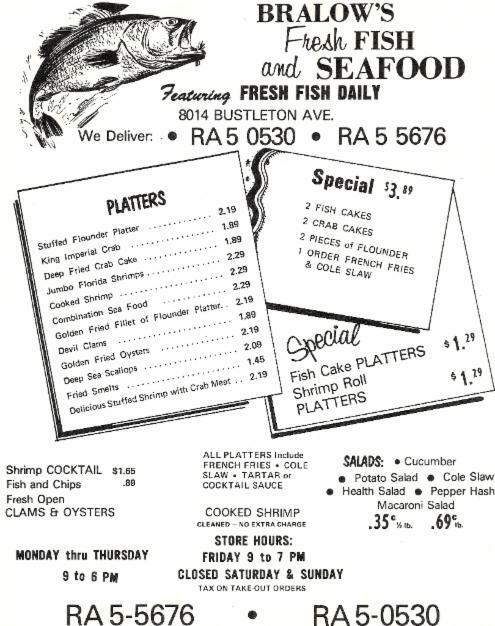 Our History - Bralow's Fresh Fish & Seafood, Inc. 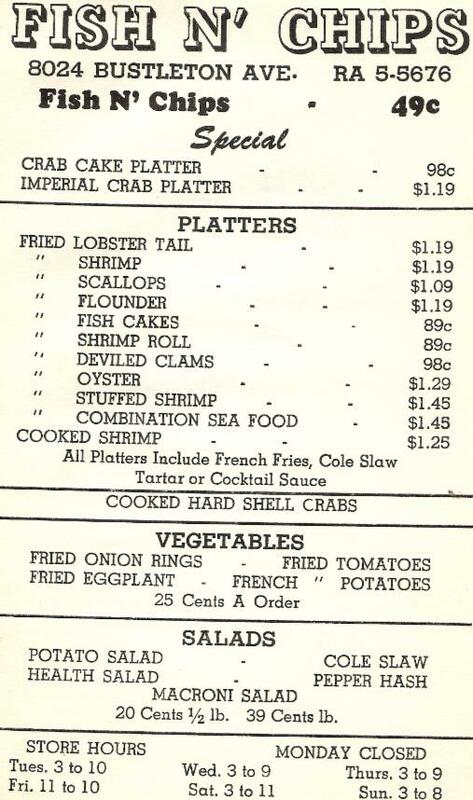 Note: The above menus are displayed to demonstrate our historic, long-standing contribution to Philadelphia's economic past. Prices and item offerings are not currently available. In 1895 Abraham Bralow began the Bralow family's long-standing business of selling quality fish and seafood. At that time, Philadelphia merchants would sell their goods from push carts throughout the city's streets. Abraham spent long days pushing his cart of fish and seafood throughout local neighborhoods. When his son, Lou Bralow, was old enough to assist his father Abraham brought him along and taught him the business. When Lou Bralow was a young adult he took the business to a new level and opened the Bralow family's first retail location at 7th and Mercy Streets in South Philadelphia. At the time, there were many retail fish markets throughout the South Philly neighborhood, but Lou set himself apart by exclusively offering the freshest quality fish and seafood at reasonable prices. Abraham taught his son from an early age to offer customers more than they would expect from other merchants. After amazing success at his 7th and Mercy location, Lou decided to expand his business and relocated to Delaware Avenue. His little shop was simply too small to accommodate the large accounts he procured from Acme and other supermarkets. Around this time, Lou's son, Don Bralow, followed in the family tradition and began working for his father. After spending years observing his father's business acumen it was time for Don Bralow to open his own business. 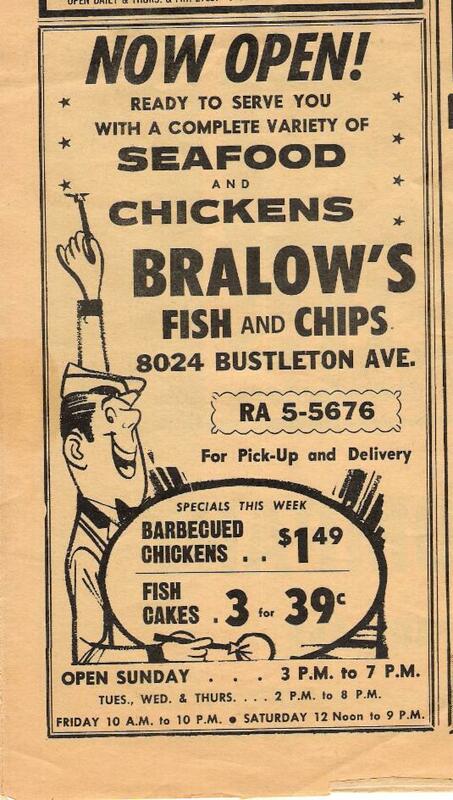 The 1960's not only brought about business expansion for the Bralow family but the city of Philadelphia as well. The city was expanding into what is now called Northeast Philadelphia. The population in Northeast Philadelphia quickly expanded. There was an increasing demand for quality retail markets. Don Bralow saw a business opportunity that would meet this need. In 1960 Don Bralow and his wife Marion moved to Northeast Philadelphia and opened a retail store on Bustelton Avenue. Many other entrepreneurs discovered business opportunities in Northeast Philadelphia, but very few shared the success and longevity experienced by Don Bralow. His fish market quickly obtained an excellent reputation by offering the best fish and seafood in the city. In 1987 Don's son Marc Bralow followed the Bralow family tradition and entered the family business. With his father's guidance, Marc decided to tap into a rapidly growing segment of food service known as prepared foods. After many successful and fulfilling years in business, Don Bralow retired in 2003. He entrusted the family business to his son, Marc Bralow. With his sight on expanding the family business, Marc decided to ask Al Antonelli to be his business partner. Al, a business school graduate, had worked for the family for years and shared Marc's vision of the future. Together they created a new menu, renovated operations and positioned the family business to compete in today's modern and dynamic small business environment. Marc and Al continue to uphold the family's reputation of providing the community with the freshest quality fish and seafood at reasonable prices. A lesson taught and passed down from Marc's Great Grandfather Abraham. Bralow's Fresh Fish & Seafood provides customers with a unique opportunity to benefit from 4 generations of knowledge and professional expertise. This ensures you the best seafood buying experience of your life. The Bralow family considers it their job to educate customers on the proper handling procedures and preparation methods of each seafood purchase. The Bralow family invites you to take advantage of their family's knowledge of everything related to fish and seafood. Welcome to the Bralow Family!